The already fast-moving app economy on iOS (s aapl) has shot up again in the past year, aided by the hot-selling iPad and iPad 2 and increased distribution of the iPhone. According to Piper Jaffray (s pjc) analyst Gene Munster, App Store downloads are up 61 percent this year over 2010, with users downloading an average of 83 apps, up from 51 last year. And iOS users are downloading 32.3 million apps per day, nearly triple the rate of the 11.9 million iTunes music tracks downloaded daily. The jump this year seems to signal a larger awakening for the App Store, which had experienced slower growth in downloads in 2010. Average downloads per user grew just 4 percent in 2010 over the previous year. Users are also paying 14 percent more per app in 2011 compared to 2010, which saw average selling prices slip 18 percent year over year. Munster crunched publicly available Apple data to come up with his model on iOS downloads. Apple recently reported that it has 425,000 apps in the App Store and recently hit 15 billion downloads,with $2.5 billion paid out to developers. 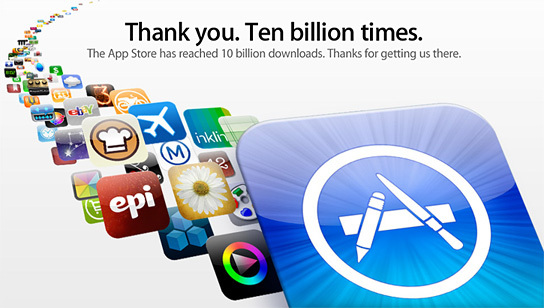 This is all good news for Apple and app developers, and it shows that the iOS ecosystem continues to grow and thrive. While the App Store brings in about 1 percent of Apple’s revenue, it is helping drive what Munster calls a “virtuous cycle,” giving consumers more reasons to buy Apple iOS devices. The growth in average selling prices — $1.48 in 2011, up from $1.29 last year — also suggests that after cutting prices in order to compete with one another, app makers are starting to see that consumers are willing to pay more for apps, which bodes well for apps that are built off paid download models. The recent growth seems to show how the introduction of the iPad and the Verizon iPhone (s vz) have also helped spur on downloads and boosted average selling prices. The average selling price of the top 30 paid iPad apps is $6.32, up 36 percent over last year. The Verizon iPhone 4 has also grown the audience for app users and, by at least one measure, now accounts for almost one-third of the iPhone 4 models in the U.S. market. Based on pricing data, Munster estimates that 82 percent of iOS apps are free and 18 percent are paid. He estimates that the App Store will generate $4.2 billion this year, with developers getting $3 billion of that. He expects App Store revenue to grow to $7.7 billion next year as users download an average of 94 apps per device. This is important data for Apple and shows that it will continue to be competitive, because its ecosystem is strong. It also shows the power of building a stable of products that are widely available. Users are unlikely to jump to another platform when they have so much invested in their iOS apps. And the improving outlook for paid downloads will continue to lure in developers looking to make money, something Android (s goog) and others are still trying to replicate. Paying more for apps? how about Australia where the aussie dollar is worth 7% more than the US dollar and yet apple charges some 10% extra when buying from Australia. Sort of reverse currency conversion just for apple. It’s about intelligent use of money. I know lots of “poor” folk who pay $70 a month for cable TV, thinking it is a necessity of life! Judicious spending means choosing something that will pay you back over the long haul, and IMHO Apple products are wise choices for the thrifty person. I think the key point is that people who tend to buy iPhones tend to be integrated into Apple’s flow. They will pay for music and they will pay for apps. Android owners are more likely to develop apps or look for free apps because of the type of people who own them. The type of person who can afford an iPhone/iOS device… Are lets face it, middle class or at least in a well paid job. And as such have a large disposable income. These people, speaking as someone who isn’t well off, are reckless with their money. Reckless? Give me a break. If you have more money you can spend more money! What is the purpose of having money if not to spend it. If I can afford an iPhone, why wouldn’t I buy one? I can afford the best experience and the best product, so I will buy it. You expect a successful person with a real job to buy the same car as someone with a fast-food salary? Your comment really can’t come across as anything but jealousy. Go to school! Put in the effort! Work hard! Network! This is how you get a ‘large disposable income’ instead of a tiny piddly one. We aren’t being reckless, just enjoying what we have worked so hard to earn. American eh? Got your capitalist notions that people get as much out of life as they put into it? It’s an economic reality that people who are born into wealth stay wealthy and those who do not are likely to break their backs getting anywhere near the same living standard that is just handed to a large proportion of the population in western countries. The iPhone is a toy/status item for the rich and people who wish so damn much to be rich. Let us not forget that that is what Apple sell. It’s a status item. I come from a farming background, I did go to school and I did get a great degree. I’m a software engineer now, and earn a great wage. It just, I spend a lot of my money on my families bills, because it’s people like you who don’t want to spend money on a liter of milk, but would rather spend it on Angry Birds. “Consumer sentiment” drives down the raw prices of our product affecting our bottom line. But you wouldn’t care about that, because you’re too busy worrying about which app to get next. How do you know someone owns an iPhone?